The Conor Pass situated on the Dingle Peninsula is probably one of the most famous and difficult climbs for cyclists in Ireland. It is quite steep and has no inch of forgiving tarmac. Only approx 3 miles and 5K in length, doesn’t look that far in paper but looking at the gradient will give you more of an idea what is involved. 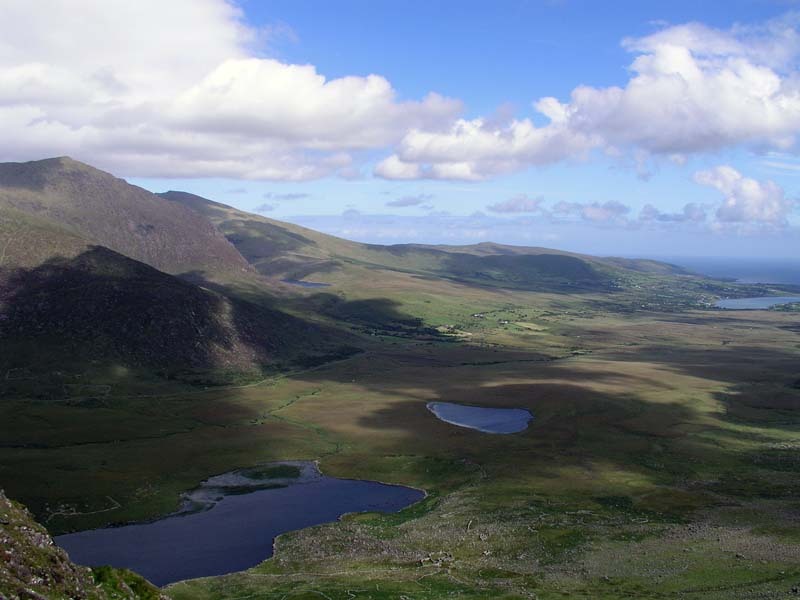 A magnificient view of both Tralee Bay and Dingle Bay await you on top and only a few meters apart. Cycled this three times in 2009 and this climb never gets easier. It is cautionable with this climb that the roads can get quite narrow near the summit so be very aware of surrounding traffic. Also it can be quite windy on the summit even if it is not apparently windy before and during the climb, it is not a climb for deep section wheels on windy wheels, I speak from experience! Had the good fortune to run to the peak of the Conor Pass from the Dingle side, the views are out of this world and well worth the effort. On September 4th 2010 will participate in the first ever Dingle Ultra 50 mile run starting outside of Camp and running over the Conor Pass into Dingle, out to Slea Head and finishing back in Dingle ; hopefully to finish all in one peace. Best wishes to all those taking part. By the way my father Jim Whitty (deceased 1993) was a very keen cyclist and was 2nd to Patsy Wall in the stage to Killorglin in the 1961 Ras Tailteann. Hey Shane. Wow I thought cycling the Conor Pass was an achievement, but running it! Best of luck on the day. Interesting to hear about your father, did he take part in many Ras Tailteann’s? Hi to all, just to fill you in on my race experience re the 1st ever Dingle 50 mile Ultra running road race. Was fortunate to run a very satisfactory race from 65 starters I finished 3rd overall and will collect my 1st All Ireland Medal (silver). The Climb over the Connor Pass was fab great views I was in 2nd place on the descent of the Pass at mile 19 only to be passed by Malcolm Gamble at mile 47. V hot race conditions from mile 24 onwards temperatures in the 70s. In response to the question posed regarding my fathers participation in the Ras Tailteann : My dad Jim Whitty cycled his one and only Ras Tailteann in 1961. he was also successful in winning a Youths All Ireland for the 50 mile time trial. He always had the fondest of memories for his participation in the Ras and especially his races in Kerry. Hi just to clarify a previous submission and error that i posted to your website. Received confirmation that the Dingle 50 mile race staged September 4th 2010 ” is a first place title only and is being awarded to Vassiliy” from race organiser Ken Dunne. Thanks to all the organisers for staging this truly great race that encompasses some of the best scenery in the country. Already looking forward to returning to next years Dingle race. Thanks. Didn’t get around to adding up yet. Will do shortly.